What was once a quick jaunt to the supermarket can turn into an endurance event with a toddler in tow. 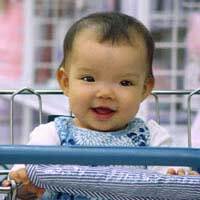 Yet the shopping still has to be done and most stay-at-home dads have no option but to invite the child along for the ride. There are plenty of parents without family nearby to help out and it can be difficult to get babysitters during the day – not to mention expensive. But a bit of planning can make the trip less arduous. First of all, it is worth remembering that shopping is not a child’s favourite pastime. If possible – although it is by no means an exact science – plan to set off at a time when the child will not be tired, hungry or in need of a fresh nappy. It is always a good idea to take a changing bag, complete with nappies, wipes, creams, nappy bags, a bottle of milk, some finger food and a couple of toys. Think of this as an emergency kit. It should accompany a househusband every time he sets foot outside the door, even if it is rarely used. If the supermarket is one that demands a deposit for the use of its trolleys, make sure to take the appropriate change – probably a pound coin. It can be a real pain trying to juggle a toddler and a handful of change while trying to get a surly shop assistant to change two 50 pence pieces for a pound coin. It is only when a man becomes a father that he realises how difficult it can be to get a parent and child parking space at the supermarket. There are loads of spaces for the disabled – a disproportionately high number it seems – yet it is rare to find a parent and child space free. Closer examination will show that one of the main reasons for such a shortage of facilities for parents is that a large percentage of the parent and child spaces are taken up by drivers who are, quite clearly, not accompanied by children. Two-seater sports cars and Transit vans occupy the spots and, although most supermarkets will listen to the legitimate complaints of parents on the issue, it is rare for anything to be done. It seems that, while people respect the need for disabled parking spaces, the areas reserved for parents and children are fair game. If a househusband has a choice of supermarkets in his area, he should plump for one with the best facilities for parents. Maybe this way the supermarkets will get the message. The threat of their child having a temper tantrum in the middle of the supermarket is enough to send a shiver down the spine of many parents. The critical gaze of fellow shoppers, unimpressed by any efforts to get the child to behave in a reasonable way, can make parents feel inadequate. To reduce the risk of a temper tantrum, the househusband should make a list beforehand and stick to it. This way the trip can be made as quick as possible and there is less time for the child to become bored and start to misbehave. Also be sure to praise the child for good behaviour in the shop.